This website centers on the ancestry and descendants of Sebastian Jose Gines Romagosa Dalmau who was born in Catalunya and settled in Manzanillo, Cuba in the late 1700's. The search for information on this Romagosa family in Cuba, its ties to Spain, and the connection among the several Romagosa branches was an originally frustrating, but ultimately fascinating and successful effort. The information was slowly gathered over a period of four years thanks to the assistance of close as well as distant relatives who each had some knowledge about the various branches. Confirmation, of relationships, however, had to wait until baptismal certificates were obtained from Manzanillo, Oriente Province, Cuba, where the family had initially settled, and, in the case of the Philadelphia/New Jersey branch, access to Ellis Island records could confirm the ties. The difficulty in finding information was due to the disruption that wars and exile had caused in family connections. Over the 200 years since the original Romagosa family arrived in Cuba from Spain around 1800, Romagosa descendants (and many other Cuban families) were dislocated twice; first, during the revolutionary wars against Spain (1868 to 1898), and then after 1959 with Fidel Castro’s communist regime. During the Cuban revolutionary war diaspora, families dispersed over the American continent. Large colonies developed in Tampa, New York, Key West and Latin American countries such as Costa Rica. The war had its effects, not only in disconnecting relatives, but also in the loss of important documents and genealogical records. Records from Bayamo, where some of those who married into the Romagosa family resided, were burned during the 10-Year War. Members of our family had to leave Cuba under persecution. -Father Elmo Romagosa (R.I.P. ), from the New Orleans Romagosas, who connected me with the Romagosas in Spain, just a few months before his death in 1999. 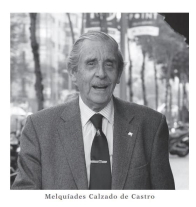 -And, most of all, thanks to Melquiades (Pete) Calzado (R.I.P. ), married to Montserrat Romagosa, from Barcelona, Spain, who, as the self-described person in charge of “foreign relations” for the Romagosa family in Catalunya, generously took it upon himself to search for the ancestors of the Cuban Romagosas in Spain. Pete, a historian by nature if not by profession, researched our roots, going through church records in Sitges (about 45 minutes from Barcelona) until he found a Juan Romagosa married to Rita Dalmau, as well as his children. He then found the connection of this Cuban branch to the Catalunya Romagosas in the 1500s, meaning that, thanks to him, the Cuban branch can now trace its ancestry all the way back to the beginning of the Romagosa family records in 1070. Thanks to all! It’s been fun getting to know you, by phone, if not in person. Wonderful family!